Origin: Selection. Southwestern Europe: dry grasslands, alpine-steppe. 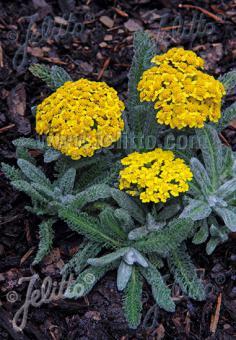 Special Features: ACHILLEA tomentosa 'Golden Fleece' (TM) flowers very rich with golden yellow umbels. Sensitive to winter leaving sites. The carpet-Garbe is easy to grow, suitable for pot culture and needs hardly any maintenance. Sowing Time Hint: Best sowing in Februar or March for first year flowering.